Technology | Ultrasound Autism Connection? Ultrasound is a version of the sonar used to “see” submarines under water. A medical ultrasound for fetal imaging has a computer, an electronic display and a transducer. The transducer sends short, inaudible, high frequency sound waves into the body. These sound waves interact with the body’s tissues and return echoes back to the transducer. The computer analyzes the echoes and converts it to a display. Sound is vibration. The intensity, or power, of the vibrations can do damage to soft tissue. Ultrasounds used in therapy create heat through the intense vibrations. Imaging ultrasounds are know as diagnostic ultrasounds and are built to operate at a much lower level of intensity than therapeutic ultrasound; however, they also create heat. TI – Thermal Index is a calculated estimate of temperature increase at the focus. TIB – Thermal Index Bone is TI for a focus near bone after a pulse has passed through soft tissue. TIC – Thermal Index Cranial is TI when the pulse only passes through a thin layer of soft tissue before encountering bone. MI – Mechanical index is a measure of pressure fluctuations within the ultrasound pulse and is a representation of the mechanical energy of the pulse. 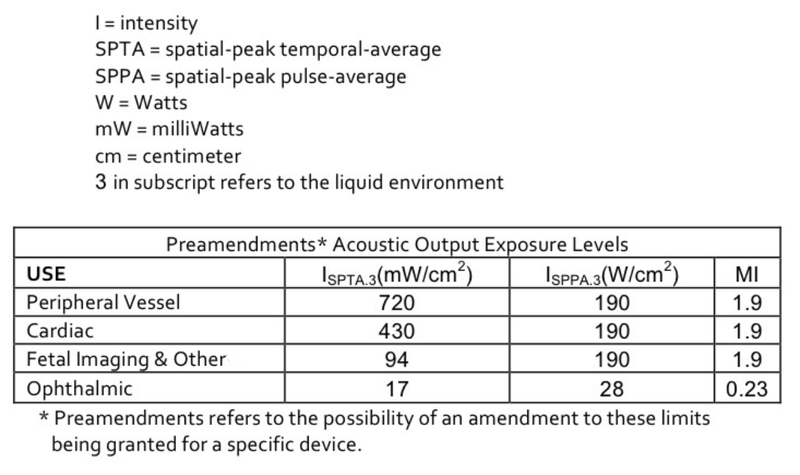 Acoustic output is in Watts per centimeter squared (W/cm2) and is ISPPA3 in equations where I is intensity, SPPA means spatial-peak pulse-average and the 3 refers to a factoring for the liquid environment. The maximum intensity averaged over the pulse time period is ISPTA3 with the units milliwatts per centimeter squared (mW/cm2). SPTA means spatial-peak temporal-average and the 3 again refers to the liquid environment. The FDA guidelines have the limits shown in the table. The spacial-peak temporal-average used to increase cell formation in the healing of broken bones is 1/3 of the limit for fetal imaging. Regulations limit the maximum capability of newer devices to 30% over the outputs in the table. There are still devices in service that were not required to have this maximum limit. David A. Toms, MD FR CPC of Canada has developed a website with a great deal of information on the technology of ultrasound (www.fetalultrasoundsafety.net).